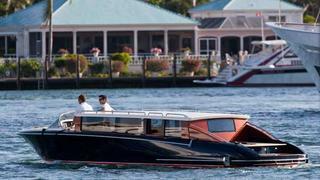 Hodgdon Yachts has released details of its luxurious 12-seater Limo Tender, which the Maine-based builder will present at the Monaco Yacht Show in September. The 10.5 metre tender is intended to extend the comfort guests feel onboard a superyacht to the shore, making the smaller boat a part of the experience – rather than a taxi to it. Indeed, the Limo’s side windows power down to reveal boarding access both port and starboard, and the salon’s hardtop rises hydraulically to ease boarding and allow greater headroom. The tender will offer all the amenities of a chauffeured luxury car, including leather seating, a high definition entertainment system, a bar and climate control (although the interiors are customisable). Two of the tenders are already onboard the 86 metre Oceanco yacht Seven Seas. The boat is one of three of Michael Peters-designed Hodgdon tenders that have been optimised for specific purposes. The trio also includes the 10.11 metre Sport Tender and the 9.15 metre Center Console Tender, for adventure-lovers. But the boats are more than toys and considerable effort has gone into their functionality and equipment, as noted by Ed Roberts, sales and marketing director of Hodgdon Yachts. ‘This series was developed with large boat captains giving input and review on virtually every detail from the type of equipment installed, where and how it was installed, down to simplifying the number of different types of fasteners in order to minimise the number and type of tools required to service equipment,’ he states. The Limo Tender is powered by a Volvo D6-370 engine and Volvo DP outdrive and can achieve speeds of up to 32 knots, even when fully loaded. The Sports Tender and centre Console Tender are powered by twin 315hp Yanmar 6LPA-STZP engines and twin Mercury Bravo Three X stern drives. Their maximum speed is 44 knots (at half load).